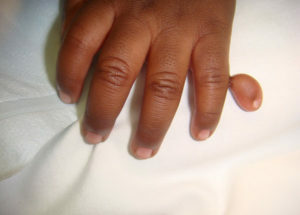 Congenital deformities of the hand are physical deformities present at birth that can significantly affect a child’s hand function and appearance. 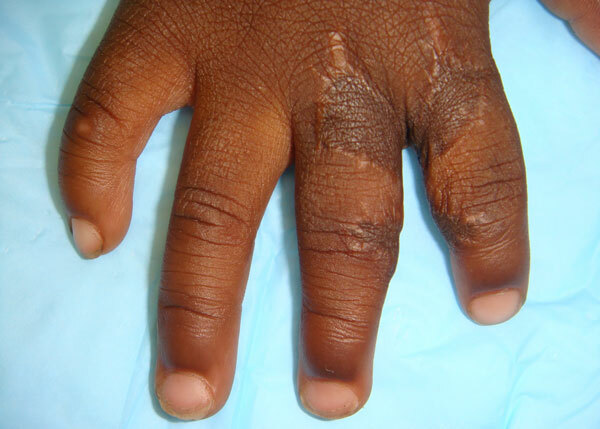 Deformities may occur as a result of abnormal development, birth injuries or genetic factors, and can involve fingers that are fused together (syndactyly), an underdeveloped hand (clubhand), extra fingers (polydactyly), and other abnormalities. Surgical treatment for congenital deformities varies depending on the type and severity of the deformity, but may include tendon transfers, skin grafts, bone manipulation, external appliances or prosthetic devices to restore normal function and appearance to the hand. Physical therapy is often needed as well to ensure proper development of hand function in young children. Polydactyly is an extra digit on the hand that may occur on the small finger side or thumb side or centrally in the hand. The most common extra digit is on the small finger aspect of the hand. Statistically, it is found most frequently in African-Americans, 1/143 live births, compared to 1/1339 Caucasian live births. It is often inherited because of autosomal dominance. 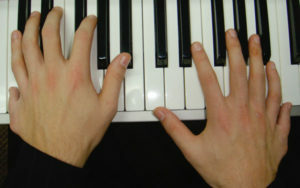 Some people with 6 fingers on each hand may play keyboards very well due to the extra reach. 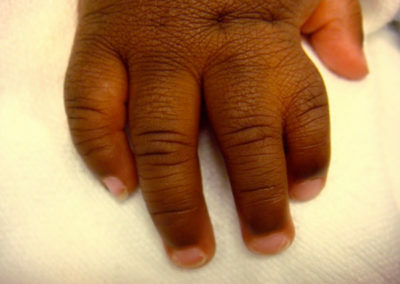 Syndactyly is the most common congenital malformation of the hand at 1/2000 births and is characterized by the webbing or fusing together of two or more fingers. There is a large degree of variation as digits may be partially fused or fused along their entire length. The fusion may be simple, with the digits connected only by skin, or in complex presentations with shared bones, nerves, blood vessels, or nails. 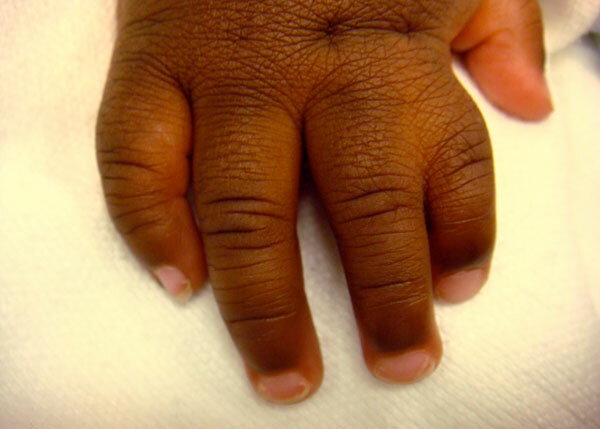 Syndactyly results from an error in fetal development, usually caused by a genetic defect. It can occur by itself as an isolated condition, or as one of several symptoms of a multi-symptom disease. Diseases associated with syndactyly include, but are not limited to, Apert syndrome, Poland syndrome, Jarcho-Levin syndrome, Pfieffer syndrome, Holt-Oram syndrome, and Edwards syndrome(or Trisomy 18). Syndactyly may be corrected surgically, usually with the addition of a skin graft.